When the Vichy regime was established, French General Charles de Gaulle, who bitterly opposed the surrender of France to the Germans, fled to Great Britain, where he set up a French Government-in-exile and rallied around him other Frenchmen who wanted to free France from the tyranny of the Germans and the collaboration of Vichy. Michel Abitbol, The Jews of North Africa During the Second World War (Detroit: Wayne University State Press, 1989), p. 56. Ibid., p. 84, as stated by I. Shapiro, president of the university organization Qol Aviv. 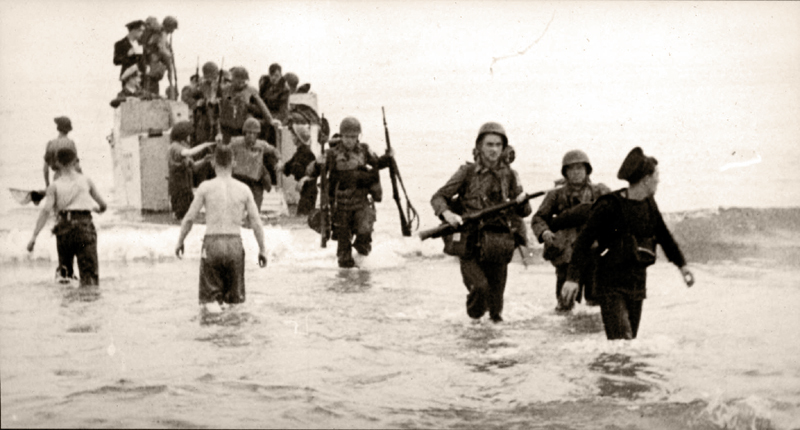 This joint British-American invasion was known as “Operation Torch”. Allied forces invaded French North Africa on November 8, 1942. The plan was for Allied forces to invade Morocco, Algeria and Tunisia in order to carry out a pincer operation against the rear of the Axis forces in North Africa. General Dwight D. Eisenhower of the US army was given command of the operation. Irit Abramski, The Jews of Libya and Tunisia in the Annals of North Africa (paper presented in Rome, Italy at Roma Tre University, 2002), p. 12. Walther Rauff was responsible for the murder of Jews in Poland and in Russia using mobile gas vans, precursors to stationary gas chambers later used at the death camps in Poland. He was transferred to an SD Einsatzkommando in Tunis in late 1942. He was captured by the Americans at the end of the war, but escaped from a prisoner-of-war camp. After being hidden in a monastery for 18 months, he made his way to Chile, which refused to extradite him. He died in 1984, still a free man. On the eve of World War II there were 400,000 Jews in French North Africa (Morocco, Algeria and Tunisia, sometimes called the “Maghreb”, meaning Arab North Africa), and another 30,000 Jews in Libya, then an Italian colony. The fate of the Jews in North Africa was different depending on the country in which they were located. In Libya, which was an Italian colony, thousands of Jews were sent to labor camps and concentration camps, and almost 600 died in these camps from hunger and disease. In the three North African countries that fell under the regime of Vichy France, Algeria, Tunisia and Morocco, the fate of the Jews was, likewise, different depending on the country. The Jews of Algeria, who held French citizenship, were stripped of their rights, required to wear an identifying mark, and subjected to admission quotas, even in primary schools. In Morocco, where Jews had civil rights but were not citizens of France, anti-Jewish laws were less rigorously enforced. The Jews of Algeria and Morocco were spared the fate of their brethren in Europe because the tide of the war turned against the forces of General Rommel at the battle of El Alamein; beginning in November 1942 the Allies began to liberate North Africa. Tunisia was the only country among the three that the German army actually occupied. 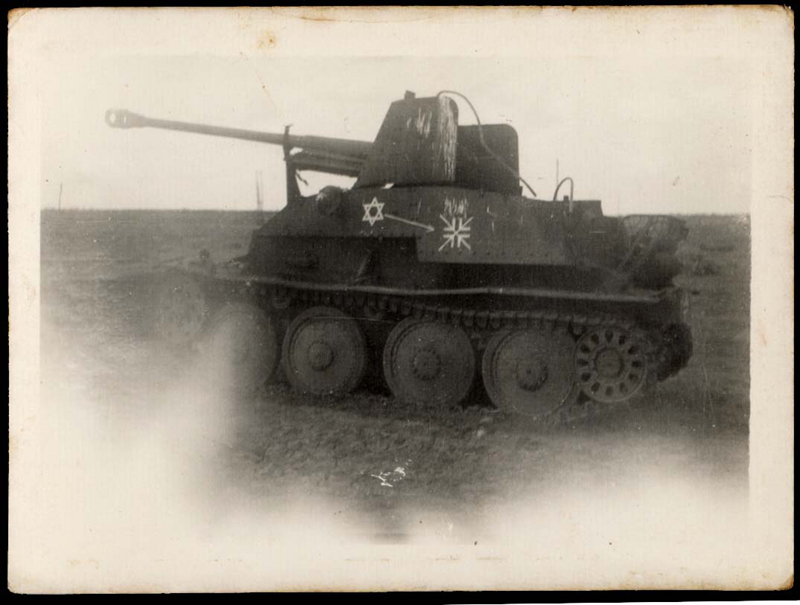 The army entered Tunisia together with a SS unit tasked with applying anti-Jewish policy. The Jews of Tunisia were saved only because in early May 1943, military developments forced the Germans to retreat. This article will discuss the situation of the Jews in France’s three North African colonies, whose treatment was greatly impacted by France’s defeat at the hands of Germany during World War II. An article on the Jews of Libya appears separately in this newsletter. Germany invaded France in May, 1940. Within a short time it became clear that France was overwhelmed militarily, and the government debated over how to proceed. Ultimately, France surrendered to Germany on June 22, 1940. The Prime Minister, Paul Reynaud, resigned over the decision to surrender, and the French President, Lebrun, apppointed a World War I hero, Marshall Henri Philippe Pétain, to replace him. Hitler had no desire to continue fighting France; he was wary of the French and their colonies in North Africa, as he was of the French navy. Thus, he agreed to an armistice with France in order to ensure that the French navy was taken out of the war and that the French would not continue to fight from North Africa. He had already set his sights on England, and was, in the spring of 1940, hoping for a quick conquest there. The armistice with France was Hitler’s way to settle the matter of France and move on to this next great conquest. 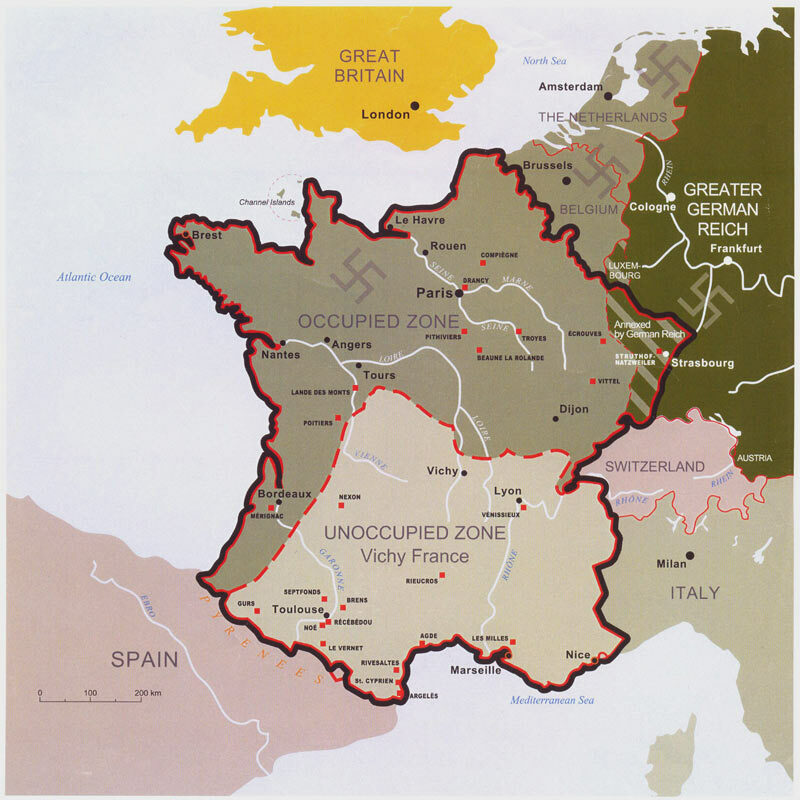 Under the armistice agreement, France was divided into two parts: the northern two-thirds of the country (the occupied zone) came under direct German control, while the southern part of the country, with its administrative center at Vichy, a spa town southeast of Paris, became the unoccupied zone, also known as “Vichy France1.” Pétain’s power thus extended over Vichy France, and over the French colonies in North Africa as well. Algeria was technically part of France, and its citizens were, therefore, French citizens. Tunisia and Morocco were French protectorates. These anti-Jewish laws, and a myriad of additional laws passed by the Vichy regime over the following two years, strictly defined who was to be considered a Jew, and steps were taken to enforce the laws and systematically push the Jews out of French society. 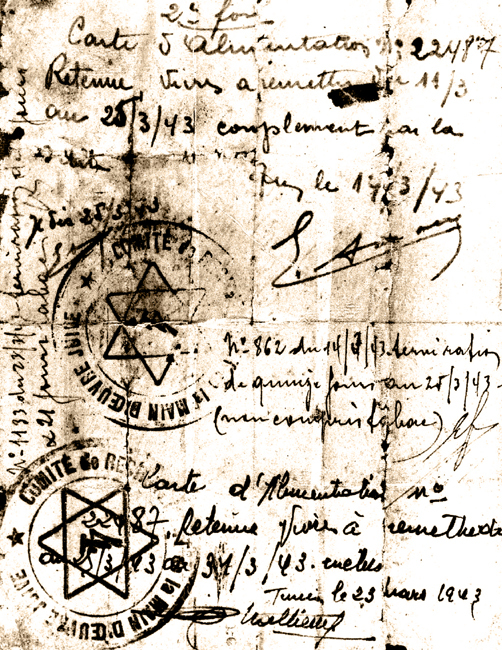 In March, 1941 the Vichy authorities set up an Office for Jewish Affairs under the direction of Xavier Vallat. The office was responsible for instituting and carrying out France's anti-Jewish legislation, including the confiscation of Jewish property and businesses. 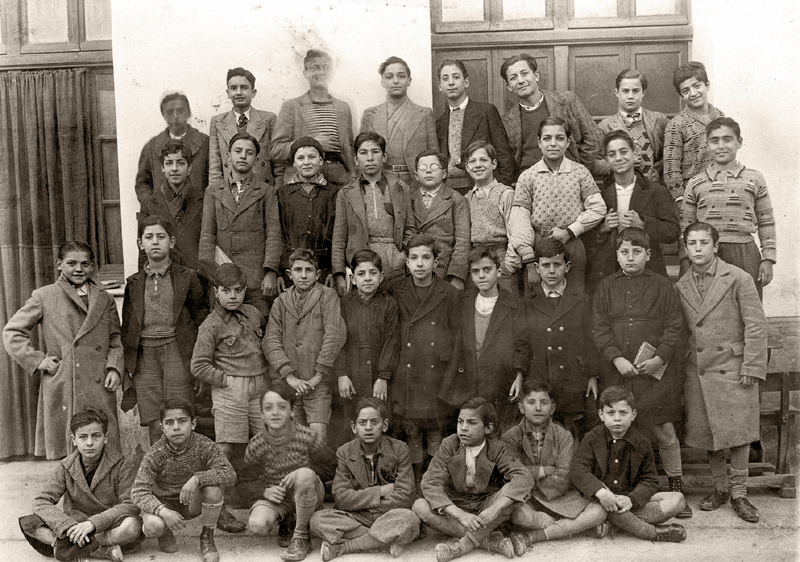 Tunis, Tunisia, Dan Efrat in a class photograph from the Rue de Colmar French school. Jews were now forbidden to hold public office and could no longer work for the government. They were stripped of their jobs as teachers in any public schools except Jewish schools. They could no longer engage in any occupations involving finance, including banking, the stock market, and trading activities. Jews could no longer own businesses. They were thrown out of their jobs in the media. In the free professions, strict quotas were instituted limiting the number of Jews who could work as doctors, nurses, pharmacists, lawyers, etc. Jews were excluded from elementary and secondary schools, and the number of Jews who could study at universities was greatly restricted. The laws were not applied to the same extent in Morocco and Tunisia as they were in Algeria. What follows is a discussion of how the Vichy regime and its laws impacted the fate of the Jews in each of these three North African territories. When the Crémieux Decree was abolished on October 7, 1940, the Jews of Algeria lost, overnight, the French citizenship that had been granted to them seventy years earlier. It did not take long for them to realize that this was only the first of many awful measures meant to marginalize and persecute them. Of all France’s colonies and protectorates, Algeria was without question the one that attracted the greatest attention of the Vichy regime concerning application of anti-Jewish legislation5. The anti-Jewish laws promulgated by Vichy France were made applicable to the Jews of Algeria directly and mercilessly, without any modifications. In defining who was a “Jew”, the Vichy laws used the notion of race as a criteria. Jews remained Jews as defined in the law even if they converted to Chrsitianity or Islam. Ironically, the Vichy laws included in their damning definition certain categories of people, like the Karaites, who had been spared from inclusion as Jews under the German-occupied definition, which turned on religion only. Moreover, the statutes that limited the role of Jews in the economy were applied to Algerian Jews without exceptions (other than some very limited ones for war heroes and war prisoners). As set forth below, the application of these laws in Morocco and Tunisia was not as rigid. In Algeria, Jews were thrown out of public administrative positions, expelled from economic life, and prohibited from engaging in a long list of businesses, including banking, the stock market, advertising, insurance, real estate, trade in grain, livestock antiquities and paintings. The terms of the decrees limiting Jews from practicing law, medicine and other “free” professions were rigorously applied. Many Algerian Jews belonged to the professional class; many more were assimilated. As such, these restrictions had a great impact on them. In addition to the Special Department for the Control of the Jewish Problem, an Office for Economic Aryanization was created in Algeria. The sole aim of this Office was to confiscate Jewish property and eliminate Jewish influence from the national economy. Trustees were apppointed for all types of industrial, commercial or other enterprises owned by Jews, with the mandate of liquidating these businesses. As an incentive, the trustees were allowed to pay themselves a percentage of the proceeds while they still held the businesses and before their sale. Interestingly, many of these trustees were so greedy that they postponed the sale of the businesses they held indefinitely, not realizing that their greed and the Allied landing in North Africa in November, 1942 would cause them to actually save the Jewish property in Algeria from liquidation7. The Algerian Office for Aryanization also adopted other laws that did not even exist in Vichy France concerning Jewish ownership of drinking establishments8. The Jews of Algeria responded to all the racist laws instituted by the Vichy regime by increasingly turning inward. The Jewish community (as it did in Germany and in many of the ghettos established throughout occupied Europe) established its own, Jewish, education system. As university students had been the first to be affected, Jewish university professors, who had themselves lost their jobs, organized during the fall of 1941 to offer courses and lectures covering a broad range of fields to the disenfranchised students. The courses included Latin, medicine, physics, chemistry, French and English. Unfortunately, this “pirate” university was ordered suppressed by the authorities and only operated until December, 1941. In addition, a central office for private Jewish education was created to help the secondary and elementary school students who had been expelled. A network of Jewish schools was created, run by Jewish administrators in Algiers, Oran and Constantine. Children were taught by Jewish instructors. The schools adopted the same curriculum, schedules and methods as the public schools had, even including music lessons and physical education where possible. Tellingly, because the Jews of Algeria were to a great extent Westernized and assimilated, the schools took pains to emphasize their French nature; religious instruction was not obligatory in any of these schools9. 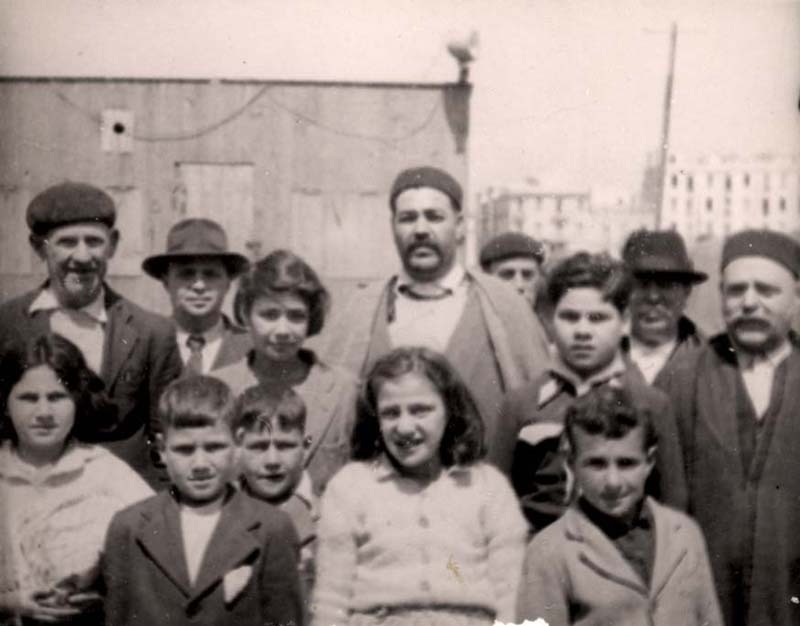 By the start of the 1942 school year, 20,000 Jewish children were accomodated by these schools; 70 elementary schools and 5 secondary schools were running in Algeria10. Though the school network was an incredible success, the Vichy authorities passed laws that allowed them to tightly control all schools that opened, including their curricula and schedules. In addition, the Vichy authorities made things difficult for the Jews as their economic Aryanization campaign led to financial distress of donors and supporters, as well as parents. The collapse of the system was just a matter of time11. Once the Vichy authorities had marginalized the Jews, pushed them out of many economic spheres and stripped them of their citizenship and their rights, the next step taken by the Vichy regime was the creation of a community government (akin to the Judenrats the Jews were required to create in German-occupied territories). In Algeria, a decree calling for the creation of the Union Générale des Israélites d’Algérie was published on March 31, 1942. All other community bodies were to be dissolved, and the UGIA was to become an organ for the implementation of governmental orders. This decree caused turmoil in the Algerian-Jewish leadership, which understood that the work of the Union would be, to a great extent, “collaboration” with the authorities. Luckily, the Union existed for barely 40 days. The Allied landing in North Africa prevented it from having to carry out the orders of the Vichy regime. 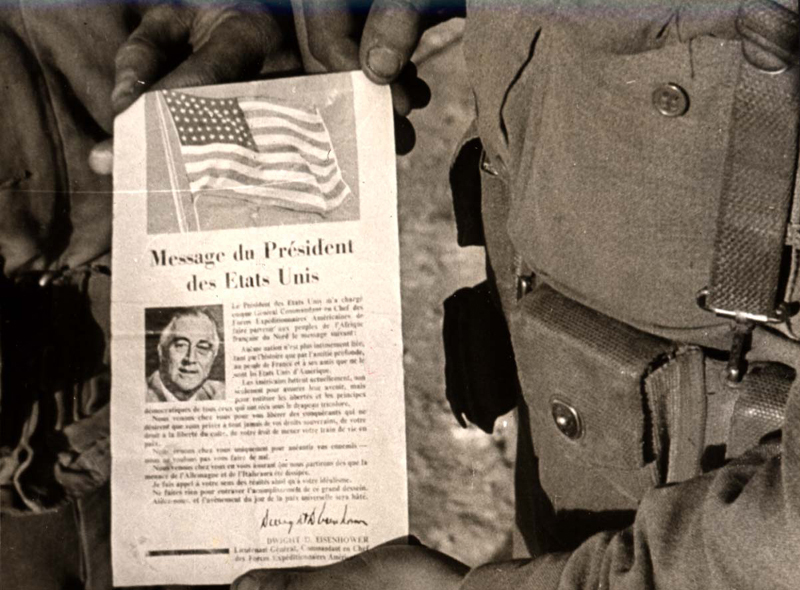 Algeria, Leaflets distributed to the French population with the invasion of the Allies. Despite all the affronts, humiliations and hardships visted on them by Vichy France, the Jews of Algeria never lost their patriotism. They continued to believe that the Germans had pressured the French authorities into instituting racist laws. The continuing faith in France of Algerian Jewish youth was expressed by one of its leaders as follows: “We are French and we state loudly that…there is no power in this world that can affect the deep feeling that unites us to our country, to its culture, to its dead.”12 Thus, many joined the Algerian underground after it was formed in 1940 by a group of young Jews, some of whom were former French army officers. Other Jewish underground groups were also established and joined the organized resistance, which made contact with certain French officials who had come to Algeria to get ready to continue the battle against the Germans. At the end of October 1942, the American authorities told the Algerian resistance about their plans to land in Algeria and Morocco13, and asked them to participate in the fight by seizing control of strategic locations in Algiers, Oran, and Casablanca. The underground was not successful in Oran or Casablanca, but fully succeeded in its part of the capture of Algiers on November 7-8. There were 377 resistance members who took Algiers - of whom 315 were Jews. Aside from the laws that had been passed against them and the restrictions to their liberty and economic freedom, approximately 2,000 Algerian Jews were put into labor and concentration camps throughout Algeria, including the camps at Bedeau and Djelfa. Though the camps were not a Vichy innovation, the plan to construct a trans-Saharan railroad to serve coal mines across North Africa was an exclusively Vichy initiative. Work camps were set up for this purpose. Prisoners were forced to labor in difficult conditions, performing strenuous work, for ten hours each day. They were poorly fed and housed, and lived in terrible sanitary conditions. Tortures and atrocities were inflicted by the guards for the slightest breach of the rules; the internees were not treated as human beings. Many died from beatings; even more died from outbreaks of typhus or just from exhaustion and hunger. The Algerian Jewish community survived due to the early Allied Liberation of Algeria in November 1942. However, the Jews were not truly "liberated." It took until the summer of 1943 for all of the anti-Jewish laws to be canclled and for the Jews of Algeria to be reinstated as citizens of France. Because Morocco was a protectorate and not a colony of France, and because its citizens were not considered to be French citizens (since the Crémieux Decree applied only to Algeria and not to Morocco or Tunisia), the implementation of the anti-Jewish laws passed by the Vichy regime was not as extreme in Morocco as it was in Algeria. In addition, the Vichy regime did not coordinate the legal texts in the protectorates with those that applied in France and Algeria. The result was, in some cases, a polyglot of differing results. For instance, in Morocco (and in Tunisia as well) a “Jew” was defined slighlty differently than in Algeria: for native Moroccan (and Tunisian) Jews, the definition of “Jew” was dependent on religion and not race (as it was in Algeria). As such, if a Jew converted to Christianity or Islam, even if he had four grandparents of the Jewish “race”, he was no longer considered a Jew as far as the law was concerned. The ironic result was that someone considered to be a Jew in Algeria for purposes of the Statut de Juifs was not considered to be a Jew for purposes of the laws in Morocco (or Tunisia). In addition, because the Jewish population of Morocco was much less assimilated than that of Algeria and relied on its own school system, the effect of certain of the anti-Jewish laws enacted by the Vichy regime was much less significant. The Jews of Morocco had kept their traditional ways of life and behavior, and this distance from Western civilization actually served them well during the war. Most Jewish students still attended the private Jewish schools of the Alliance Israélite Universelle and not the public Moroccan schools. Few attended university. Thus, the Jewish students and children were not directly affected by the anti-Jewish legislation that, in Algeria, wreaked havoc on the educational system. Another factor was the flexibility of Moroccan law and the Moroccan authorities. During World War II, Morocco’s monarchy remained in place, while French military presence was established. Dahirs, decrees of the Moroccan sultan, allowed for flexibility in the implementation of the anti-Jewish laws. For instance, a dahir allowed Jews to continue to hold certain jobs, and another dahir allowed the Jews free access to the crafts and the retail trade, even though they were still forbidden from borrowing capital. The residents-général of Morocco did not deem it necessary to promulgate execution orders for the decrees that restricted Jewish access to professions including law, medicine, architecture, etc. There were fewer economic laws enacted, and slower enforcement of those laws that were enacted. Public sentiment and rumor has, for a long time, given Sultan Muhammad V credit for helping his Jewish subjects by putting himself between them and the Vichy administration. For instance, according to Serge Berdugo, Ambassador at Large for Morocco, the Moroccan king vowed to his father, a Jewish community leader during World War II, that “no harm would come to Jews which did not affect first my family and myself.14” However, the monarch had no choice but to put his seal on the dahirs submitted to him by the Vichy administration, and did not take public positions that could be interpreted as criticism of Vichy policies15. Apparently, the warm welcome given by the king to the Moroccan Jewish delegations that came to discuss with him the serious consequences of the application of the anti-Jewish legislation in the spring of 1942 is the only completely positive gesture made by the sultan to the Jews of Morocco. However, at the same time, the local business and manufacturing associations and labor unions in Morocco strengthened the adverse economic implications of the anti-Jewish statutes. Eager to eliminate Jewish competition, these organizations moved to expel Jewish members and fire Jewish employees. Jewish businessmen and tradesmen were harassed, expelled from business associations and fired from their jobs. Although there was no ghettoization as such, Jews who had moved into European urban neighborhoods were forced to move back to the traditional Jewish quarters, known as the mellah. As in the rest of French North Africa, approximately 2,100 Moroccan Jews were interned in work camps set up throughout Morocco. The camps were connected with the trans-Saharan railroad project, described above. Conditions at the camps were horrendous, and many died from hunger, exhaustion and disease. 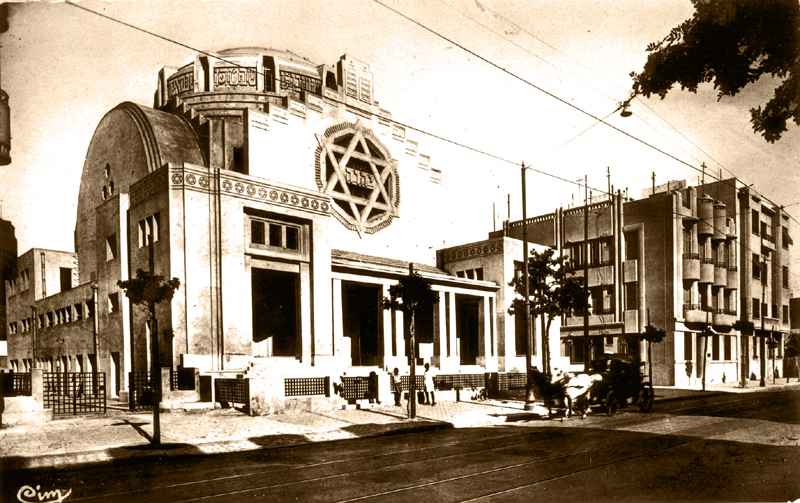 Tunis, Tunisia, A synagogue on Paris Boulevard. Tunisia was the only one of the three French North African territories to have direct contact with the German army – the country of Tunisia was occupied for approximately six months during the course of the war. Though the German army was accompanied by SS units who came prepared to implement the Final Solution, the Jews of Tunisia were saved because the fortunes of war favored the Jews; the Germans did not have time to subject the Jews to the fate of the Jews in Europe. The situation of the Jews in Tunisia was very different from the other French North African countries for a number of additional reasons. French and Muslim officials in Tunisia were sympathetic to the Jews, and were not enthusiastic about implementing the race laws. The Vichy governor of Tunisia, Admiral Jean-Pierre Estéva, delayed the implementation of the racist laws for a long time, benefitting the Jews. The anti-Jewish measures adopted by Vichy France were roundly criticized by Estéva, who did not believe that the laws were moral, or that they were in the interests of Tunisia or France. Estéva was apparently a religious man, who found himself torn between his Christian faith, on the one hand, and his duty and loyalty to Marshall Pétain, on the other. Extraordinarily, during this period when racist, anti-Jewish legislation was being promulgated in Vichy France and zealously enforced in Algeria, Estéva actually visited the ancient synagogue of Ghriba at Djerba in May, 1941, and made donations to the Jewish poor on the eve of Passover in both 1941 and 194216. The local Tunisian rulers during this period, Ahmed Pasha Bey and his successor, Moncef Bey, were also sympathetic to their Jewish subjects. Moncef Bey actually awarded the highest Tunisian distinction, the Nishan Iftikhar, to about 20 Jews during this time of increasing racism and persecution of the Jews. Among them were doctors and businessmen. Tunis, Tunisia, A document confirming the receipt of food coupons during the Nazi occupation. Estéva, together with the Tunisian rulers, postponed the publication of the orders required to enforce many of the economic laws bombarding the Jews. 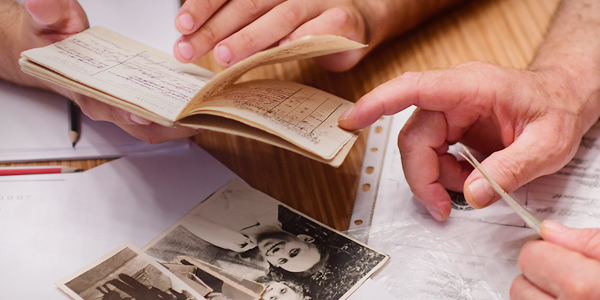 When finally, under pressure from Vichy France, he was forced to implement the orders, he slowly phased in the various deadlines for the eviction of Jews from their different professions to ease the financial hardship involved. Jewish medical doctors and disbarred lawyers were allowed to continue to take care of sick Jews and to represent Jews before rabbinical courts. Jews were still allowed to maintain their own press and to represent the Jewish population in elected assemblies. No rules were ever written to designate temporary trustees, which almost completely stymied the Vichy regime in their efforts to confiscate Jewish property17. Ironically and unexpectedly, what tipped the scales for the Tunisian Jews and appreciably hindered the application of the racial laws was the role played by Italy – despite the fact that it was an Axis power. There were large numbers of Jews in the Leghorn and Grana communities of Tunisia – communities that had originated from Livorno in Italy, some of which had existed since the 17th century. During the war, there were approximately 5,000 Jews with Italian citizenship. Their ties to Italy were strengthened during World War I when Italy fought on the same side as France. Even when the Fascists rose to power, the Livornese Jews continued to support Italy. Because of these ties, Italy intervened to protect Jews with Italian citizenship. The Italian ambassador actually petitoned Berlin to prevent the aryanization of Jewish property and the enforcement of the Vichy laws, claiming that France was trying to weaken Italian economic and political interests in Tunisia and drive a wedge between the Axis powers. This put the Germans in a very awkward position – they wanted to impose laws against the Jews in all the countries in Germany’s sphere of influence. However, the German authorities finally decided not to intervene. Thus, Italy was able to prevent implementation of the race laws of the Vichy government. In addition, lengthy correspondence between the Italian government and the Vichy government delayed implementation of the laws even further. This worked to the advantage of all the Jews in Tunisia, and not just to those who had Italian citizenship, weakening the effect of the aryanization measures of the Vichy regime. During the period of the German conquest, moreover, the protection Italy extended to the Jews of Leghorn fully exempted them from property expropriation and from being sent to camps and forced transit stations. When Italy stubbornly refused to force her Italian citizens to wear the yellow star, none of the Jews of Leghorn (not just the Italian citizens) were made to wear it18. However, the fortunes of Tunisia’s Jews changed completely when Tunisia was invaded by the Germans as a response to “Operation Torch” on November 9, 1942. 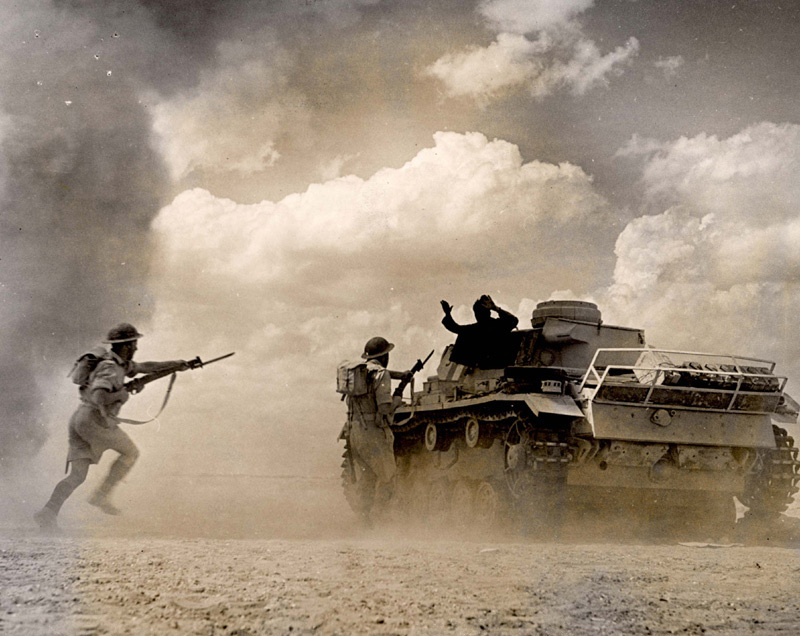 The Germans occupied Tunisia for six months, from November, 1942 through May, 1943. Though the German’s military policy was confused and disorganized during this time, their policy regarding the Jews was cohesive and consistent – they began to take action against the Jews of Tunisia as early as two weeks after their invasion. First, they arrested the leaders of the Jewish community. At the same time, they ordered 3,000 Jews to be forced to work on fortifications in northern Tunisia. The SS officer in charge of the persecution of the Jews was Colonel Walther Rauff19. Rauff demanded thousands of Jewish workers, and demanded as well that they wear a yellow star on their backs so that they could be identified from a distance and shot in the event they tried to escape20. 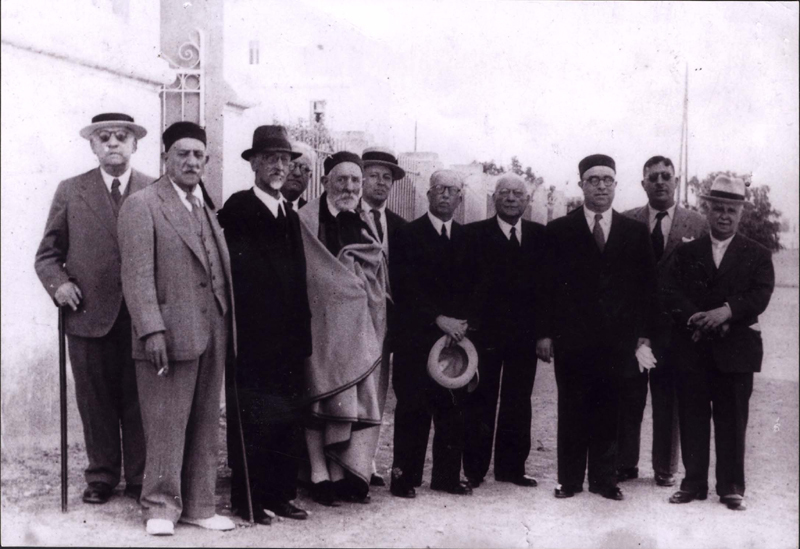 Tunis, Tunisia, Rabbi Cheim Baleish (fifth from left), the Chief Rabbi of Tunisia with members of the Jewish council, 1942- 1943. Immediately after Rauff’s decree, Jews were beaten in the streets at random, kidnapped and taken to deportation points, and synagogues were burglarized. Threats were made against the entire Jewish community. In the face of these violent incidents, the Jewish community decided to obey the Germans’ instructions. A special committee of Jewish leaders was elected, called the Comité de Recrutement de la Main-d’Oeuvre Juive, which, like the Judenrats in Europe, became a tool in the hands of the Germans. As they did in Europe, the Germans forced the Jewish community itself to supply them with forced laborers, as well as to feed the laborers and provide them with tools. The result was the same agonizing moral dilemma that was faced throughout Europe by the Judenrats: how could they make life or death decisions and choose the men to be sent to labor camps? Ultimately, almost 5,000 Jews, most of them from Tunis and from certain northern communities, were taken captive and incarcerated in 32 labor camps scattered throughout Tunisia. The biggest and most lethal of these were the camps in Bizerte and Mateur, where tens of Jewish prisoners died from disease, labor, punishment by the German guards and Allied bombings. Fortunately, the Allied forces captured Tunisia: on May 6, 1943, the British took the capital city of Tunis, and American forces reached Bizerte. By May 13, 1943, the Axis forces in Tunisia had surrendered. This change in the fortunes of war was what serendipitously saved the Jews of Tunisia from a much different, and darker, fate. Though the Jews of Tunisia were saved from annihilation, they were subjected to harsh treatment by the returning French, who arrested and imprisoned dozens of Jews as collaborators. They were not released for several weeks. North Africa, British soldiers capturing a German tank. As we have seen, the situation for the Jews in North Africa varied from country to country, even within the territories subject to Vichy France. Though racist laws were introduced in 1940 in all three territories, they were implemented with different degrees of enthusiasm in each. However, common to all three territories was the murderous intent of the Nazis. Like their brethren in Europe, the Jews of French North Africa were subjected to the same series of stages that were the prelude to murder: the Jews were stripped of their liberty, their livelihoods, their property and their dignity. All across North Africa, they were sent to labor camps where hunger, disease and horrific treatment were rampant. The force majeure that saved the Jews of the Maghreb from the last stage of the Final Solution – systematic mass murder – was the tide of the war.